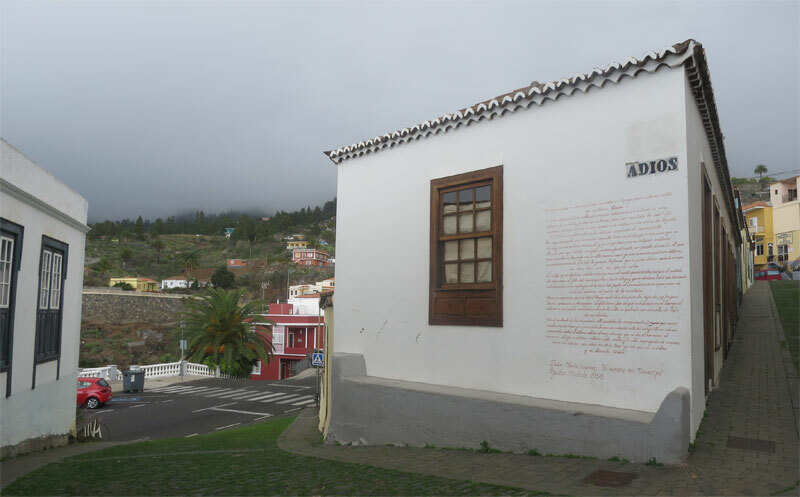 “If you come to visit my island, La Palma, do not forget Tijarafe where there is a street called Adios… (…) What kind of secret did it cherish that its memory has endured across a distance, measured by waves, from almost a lifetime ago? We knew it later on. It was neither a shadow of love nor of mystery, it was not an aroma of legend (…) “Adiós” (Goodbye) simply, was the street which led to the cemetery. But I am going to say that it was in an exquisite manner: it was with poetry, something which scarcely exists in municipalities, or rather in any subject matter. I do not think that it was named by councillors: it was the village, a tiny village, which got used to calling it that, or it was born with its name, which was private, innate, exact. Hence the grace, the delicacy which could not be forgotten by those who looked at it when they were children. The street goes down a slope, cut on a rock; the village is located above it, with a handful of houses on the verge of the ravine. But going down, and on the slope which descends vertically, on a fold of the rock, the cemetery, put there as if it were a bunch of lemon blossoms on the mountain’s chest. It is well understood that it is difficult to reach that place, even for the children of this rugged countryside, experienced in crossing over ravines. This was the origin of the custom of stopping at the opening where the street was broken up by a series of gullies running downhill. This used to be the threshold of the farewells: companions would remain there for a while, watching a small group of people go down. There, in a touched silence, the friend gave the leaving friend the last greeting, brothers to brothers…Afterwards they went up the street in silence and the street, impregnated with sighs, rich in goodbyes without exit, could have just one name: and it was called Adios (Goodbye)”.